For the West Indian cricketer, see Jason Campbell (cricketer). Campbell with the Raiders in September 2011. Jason S. Campbell (born December 31, 1981) is a former American football quarterback who played in the National Football League (NFL). He was drafted by the Washington Redskins in the first round of the 2005 NFL Draft. He played college football at Auburn. Campbell also played for the Oakland Raiders, Chicago Bears, Cleveland Browns, and Cincinnati Bengals. A 2000 graduate of Taylorsville High School in Taylorsville, Mississippi, Campbell went on to play college football at Auburn. As a starter he had a different offensive coordinator every year, finally finding success in his senior year when he led the Tigers to an undefeated season in 2004 and was named the SEC Player of the Year and MVP of the SEC Championship Game. Campbell previously held the record for the longest touchdown completion in Auburn football history, an 87-yard pass to Silas Daniels in a 2004 matchup versus Louisiana Tech, a record that is now held by Cam Newton, who completed a 94-yard pass to Emory Blake on October 2, 2010 in their victory over Louisiana-Monroe. Campbell graduated from Auburn with a degree in public administration. Campbell was drafted as the 25th pick in the 2005 NFL Draft by the Washington Redskins under General Manager Vinny Cerrato. The Redskins traded up in the draft to get Campbell, surrendering a third round pick in the 2005 NFL draft, along with first and fourth round picks in 2006. Campbell didn't play in his rookie season, sitting on the bench behind Mark Brunell and Patrick Ramsey. On November 13, 2006, Campbell was named the Redskins starting quarterback, and on November 19, 2006, Campbell made his first career start. Despite losing in his first start to the Tampa Bay Buccaneers, Campbell was praised for his poise. On November 26, 2006, Campbell had his first win of his pro career, leading the Redskins to a 17–13 victory over the Carolina Panthers. Campbell completed 11 passes on 23 attempts for only 118 yards, with two touchdowns and one interception. Campbell threw a 66-yard touchdown pass to tight end Chris Cooley in the fourth quarter. On August 18, 2007, Campbell was tackled at the knee by Pittsburgh Steelers' DE Brett Keisel in the second preseason game. Initially, the injury looked severe but Campbell eventually walked off the field on his own. Trainers said that Campbell's ligaments were not torn and announced his injury as a bruised knee. On December 6, 2007, Campbell dislocated the patellar ligament of his left knee during a game against the Chicago Bears. The injury did not require surgery but Campbell did not play for the remainder of the season. When Joe Gibbs retired for a second time at the end of the 2007 season, the Redskins hired Jim Zorn, first as offensive coordinator and then naming him head coach. Zorn said at the time he would also serve as quarterbacks coach. The Redskins started the season 6-2, prompting observers to declare Campbell one of the NFL's elite quarterbacks, and the "tough love" approach from head coach Jim Zorn a success. The team, however, then went on to lose six of their remaining eight games to end the season 8-8, missing the playoffs. At the end of the season, it was unclear if the Redskins were on the road to improvement or decline. Questions arose on the future of Campbell as the starting quarterback for the Washington Redskins. Despite pursuing other quarterbacks in the offseason, the Redskins were unable to acquire Jay Cutler or Mark Sanchez, opting to start Campbell for the last year of his contract. Campbell and the Redskins ended 2009 with a 4-12 record, one of the worst in Redskins' history. The often rocky relationship Campbell had with head coach Jim Zorn ended with Zorn's firing. New Washington head coach Mike Shanahan said the Redskins would tender Campbell an offer leading up to the 2010 free agent period, ensuring that if he signed with another team, Washington would receive draft picks in compensation. After the Redskins acquired Donovan McNabb, Campbell was traded to the Oakland Raiders on April 24, 2010 for a fourth round pick in the 2012 NFL Draft. On the same day, Campbell received a one-year contract extension through the 2011 season. Raiders owner Al Davis compared Campbell to former Raiders quarterback Jim Plunkett. In the opening game on the road against the Tennessee Titans, Campbell had an unspectacular start to his Raiders career as the Raiders were routed 38-13. He would complete 22 of 37 passes for 180 yards and throw one touchdown and one interception. Campbell and rookie offensive linemen Jared Veldheer, playing in the unfamiliar role of center, would also suffer multiple miscues and combine for three fumbles, losing one. The offense as a whole would fail to click until the fourth quarter when Campbell completed 7 of 9 passes in a 12-play, 72-yard drive that culminated in a 7-yard touchdown pass to Darren McFadden. In week two against the St. Louis Rams Campbell would endure another lackluster performance, completing 8 of 15 passes for a mere 87 yards and an interception. At half-time he was benched in favor of his backup, Bruce Gradkowski, in the hope of providing the Raiders offense with the spark it desperately needed. Gradkowski would go on to lead the Raiders to a tight 16-14 victory. Following Campbell's less than inspiring performances in the first two weeks, the Raiders' coaching staff decided to go with Bruce Gradkowski as the starting QB and demoted Campbell to the role of backup. The offense would show a marked improvement in the Week 3 and 4 match-ups against the Arizona Cardinals and Houston Texans respectively. Gradkowski would throw for 255 and 278 yards albeit in losing efforts. During the Week 5 home game against the Chargers, Campbell would come off the bench late in the first quarter to replace an injured Gradkowski. Behind a solid game by running back Michael Bush, Campbell was vastly improved as he completed 13 of 18 passes for 159 yards and a touchdown. Aided by a touchdown on a blocked punt in the first quarter and a forced fumble returned for a touchdown late in the fourth quarter, the Raiders would win the game 35-27 and snap a 13-game losing streak against the Chargers dating back to 2003. After his improved play in the relief effort against the Chargers and with Gradkowski injured, Campbell was re-installed as the starter for the Week 6 match-up against the cross-Bay rival San Francisco 49ers. The Raiders were unable to find any spark on offense as Campbell once again struggled, completing just 8 of 21 passes for 83 yards and throwing two interceptions. The Raiders would go down 17-9 to then winless 49ers. Although coming off of his worst performance as a Raider, Campbell was assured the start against the division rival Denver Broncos in Week 7 due to Gradkowski's continuing struggles with the shoulder injury he sustained against the Chargers. Campbell and the Raiders started hot against the Broncos, jumping out to a 24-0 lead by the end of the first quarter and never let up in a 59-14 rout. The 59 points scored was a new franchise record. Campbell would complete 12 of 20 passes for 204 yards with two touchdowns and no interceptions for a QB rating of 127.9. Campbell would throw a 43-yard touchdown pass to tight end Zach Miller on the game's opening drive and a 19-yard touchdown pass to running back Darren McFadden. Ironically, while Campbell was benched by coach's decision, the Raiders lost all three of the games that Campbell did not play in, as the Raiders finished the season at 8-8 and missed the playoffs. They were able to sweep all six division games, and Campbell ended the season with his second-highest quarterback rating of any season (84.5). In 2011, Campbell started the first 6 games, leading Oakland to a 4-2 record before suffering a collarbone injury. To replace him, the Raiders traded draft picks to the Cincinnati Bengals for veteran quarterback Carson Palmer. Campbell signed with the Chicago Bears on March 13, 2012 to a one-year contract as a backup to Jay Cutler. In Week 10 against the Houston Texans, Campbell replaced Cutler, who had gone down with a concussion. In the game, Campbell completed 11 of 19 passes for 94 yards and a 70.9 passer rating. On November 16, Cutler was ruled out of the Bears-San Francisco 49ers game, meaning Campbell would start the game. The Bears went on to lose 32-7. On March 26, 2013, Campbell signed a two-year contract with the Cleveland Browns. On September 18, 2013 it was announced that previous 3rd string QB Brian Hoyer would start ahead of Campbell for the team's next game on September 22, 2013 against the Minnesota Vikings, as starting quarterback Brandon Weeden sat with a thumb injury. On October 23, it was announced Campbell would receive his first start as a Brown Week 8 vs the Kansas City Chiefs. The outing resulted in a 17-23 loss for the Browns, although Campbell's performance was viewed favorably, passing for 293 yards, 2 TDs and 0 interceptions. In week 9 Campbell snapped the Browns 11 game losing streak to the Ravens, throwing for 262 yards and 3 scores on his way to AFC offensive player of the week honors  Campbell ended the 2013 season 1-7 as a starter for the Browns. On March 12, 2014, Campbell was released by the Browns, along with fellow quarterback Brandon Weeden. Campbell at Bengals training camp in 2014. On March 19, 2014, Campbell signed a one-year deal worth $1.5 million with $400,000 guaranteed with the Cincinnati Bengals. He played in the 2014 preseason as backup to Andy Dalton. He played in 4 games for the Bengals, all of which were decided by 21+ points. In April 2015, Campbell strongly hinted at retirement, declining offers from multiple teams. He was approached by the Indianapolis Colts in November 2015, but declined to come out of retirement to be a backup to Matt Hasselbeck, who was starting in place of an injured Andrew Luck. Campbell is the cousin of basketball player LaSondra Barrett. Campbell is a Christian and has said, "I'm not perfect by any means, but I know my strength comes from God. Without Him, I wouldn't be in the position I'm in today." ↑ "Cam Newton, Auburn have put up big offensive numbers heading to the Iron Bowl". Alabama Local News. 2010-11-21. Retrieved 2012-11-12. ↑ "Jason_Campbell". 2007-12-07. Retrieved 2007-12-09. ↑ "Historical NFL Wonderlic Scores". wonderlictestsample.com. Retrieved September 2, 2016. ↑ "Jason Campbell". nfldraftscout.com. Retrieved September 4, 2016. ↑ "Trade tracker: Draft deals - NFL - ESPN". Sports.espn.go.com. 2005-04-24. Retrieved 2010-09-23. ↑ FRED GOODALL, AP Sports Writer (2006-11-19). "Bucs 20, Redskins 17 Associated Press Sports". Sports.yahoo.com. Retrieved 2010-09-23. ↑ JOSEPH WHITE, AP Sports Writer (2006-11-26). "Redskins 17, Panthers 13 Associated Press Sports". Sports.yahoo.com. Retrieved 2010-09-23. ↑ Corbett, Jim (2008-10-25). "With tough love from Zorn, Campbell now among elite QBs USA Today". Usatoday.com. Retrieved 2010-09-23. ↑ "Redskins quarterback Jason Campbell prepares for season finale, and an uncertain future". Washingtonpost.com. 2009-12-31. Retrieved 2010-09-23. ↑ "Zorn fired after 12-20 run with Redskins ESPN". Sports.espn.go.com. 2010-01-04. Retrieved 2010-09-23. ↑ "Mike Shanahan says Redskins will tender Jason Campbell an offer". Washingtonpost.com. 2010-02-27. Retrieved 2010-09-23. 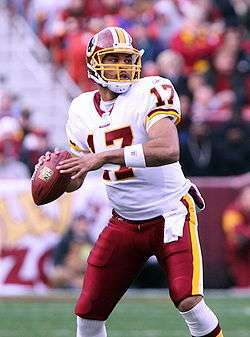 ↑ Rick Maese and Jason Reid, "Redskins trade Jason Campbell to Raiders", Washington Post, April 25, 2010. 1 2 "2010 NFL training camps: Al Davis of Oakland Raiders likens QB Jason Campbell to Jim Plunkett - ESPN". Sports.espn.go.com. 2010-08-11. Retrieved 2010-09-23. ↑ "Jason Campbell Injury: Raiders QB Breaks Collarbone Against Browns (VIDEO)". The Huffington Post. 2011-10-16. Retrieved 2012-10-12. ↑ "Oakland Raiders acquire Carson Palmer from Cincinnati Bengals". ESPN. 2011-10-19. Retrieved 2012-10-12. ↑ Brooks, Matt (2012-03-14). "Jason Campbell signs with Chicago Bears to back up Jay Cutler - The Early Lead". The Washington Post. Retrieved 2012-10-12. ↑ "Jay Cutler gets concussion in Chicago Bears' loss". National Football League. 2012-11-11. Retrieved 2012-11-11. ↑ Mayer, Larry (2012-11-11). "Cutler exits with concussion symptoms at halftime". Chicago Bears. Retrieved 2012-11-12. ↑ Seligman, Andrew (2012-11-16). "Bears' Cutler to miss 49ers game with concussion". Yahoo! News. Retrieved 2012-11-16. ↑ "Colin Kaepernick throws 2 TDs in first start as 49ers drub Bears". Game HQ. Associated Press. 2012-11-19. Retrieved 2012-12-18. ↑ Withers, Tom (2013-03-26). "Browns sign QB Jason Campbell to 2-year deal". Yahoo! Sports. Retrieved 2013-03-26. ↑ Xchange, Sports (2013-09-18). "Hoyer bests Campbell for Browns' QB job". Chicago Tribune. ↑ Rosenthal, Gregg (2013-10-23). "Jason Campbell tabbed Cleveland Browns' starting QB". National Football League. Retrieved 2013-10-23. ↑ Manoloff, Dennis (2013-10-28). "Jason Campbell Report Card". Cleveland Plain Dealer. Retrieved 2013-10-28. ↑ "Jason Campbell Names AFC Offensive Player of the Week". ↑ Hanzus, Dan (March 19, 2014). "Jason Campbell, Cincinnati Bengals strike 1-year deal". NFL.com. Retrieved 2014-03-19. ↑ Florio, Mike (April 11, 2015). "Jason Campbell leans toward retirement". NBCSports.com. Retrieved February 1, 2016. ↑ Hanzus, Dan (June 15, 2015). "Jason Campbell likely to retire after 10 seasons". NFL.com. Retrieved February 1, 2016. ↑ Gantt, Darin (November 12, 2015). "Jason Campbell turns down Colts offer in favor of "chilling"". NBCSports.com. Retrieved February 1, 2016. 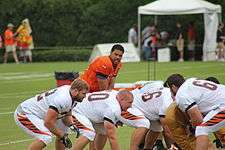 ↑ "NFL, Jason Campbell, Quarterback for Cleveland Browns Testifies God Faithfulness in His Life". Wikimedia Commons has media related to Jason Campbell.